Sister Daniel Joseph Pardini, or “D.J.,” spent thirty-two years ministering to the people of Hong Kong and Hawaii. 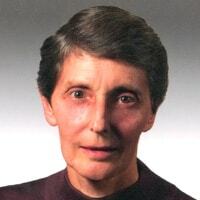 Born in San Jose, California she desired to dedicate herself to God as early as age fifteen, so in 1962, at twenty-one, Sister entered Maryknoll. Prior to joining, Sister D.J. had become an R.N. at O’Connor Hospital. After professing first vows, she also earned her A.A. at Rogers College and then set out for Hong Kong. Arriving in 1966, Sister D.J. found herself immersed in the challenges of a foreign culture. The bustle and grit of the city were unfamiliar, though her interactions with the people, as she immersed herself in language study, brought her to a new understanding and love for the Chinese. Sister D.J. began work as a Supervisor at Our Lady of Maryknoll Hospital in 1967, continuing, in the years that followed, as Assistant Nurse in the Female and then the Chronic Wards. In 1979, Sister D.J. returned to the Maryknoll Center for Congregational Service in the Health Unit. After three years, she then set out for an eleven month assignment to the Western U.S. Region, where she worked with the Hospice program in Santa Clara, California. In 1982, Sister D.J. returned to Hong Kong’s Maryknoll Hospital. She then began special work as an Assistant Matron, later expanding her work to pastoral ministry in three government hospitals. In 1988, Sister D.J. went to Hawaii, a place she grew almost immediately to love as a second home. She would spend the next fifteen years ministering to the poor and homeless, seeking to become a witness to God’s love in their lives through her work in the Housing Projects. Sister D.J. also held workshops targeted to nutrition, vocational training, and personal dignity. Since 2004, Sister D.J. has been an active and prayerful member of the Monrovia Community in California.